After being disappointed by Halloween at Magic Kingdom last year, we decided to take advantage of currently having Premier Passes (and use the last of this year's DVC points) and do another Disneyland trip this year specifically to enjoy Halloween time at Disneyland. 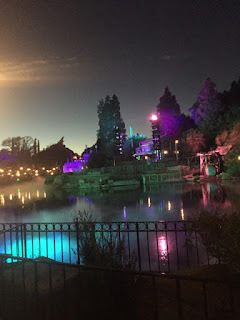 I was a little worried that the only reason we preferred the Disneyland Halloween party was because it was less crowded and had not been sold out like all parties were this year. However, it turned out to not feel as chaotic as Mickey's Not So Scary Halloween Party last year even though it was more crowded than last Mickey's Halloween Party experience in 2011. We got in line to enter Disneyland for the party around 2:30pm. The lines weren't very long and they started letting us in early, so we had our wristbands, treat bags, and were actually in line for Buzz Lightyear by 2:50 p.m. To kill time until the pre-party in Mickey's Toontown started at 5pm, we did the full circle tour on the Disneyland Railroad (really missing not having 'it's a small world' to kill time this trip) and Buzz Lightyear again. 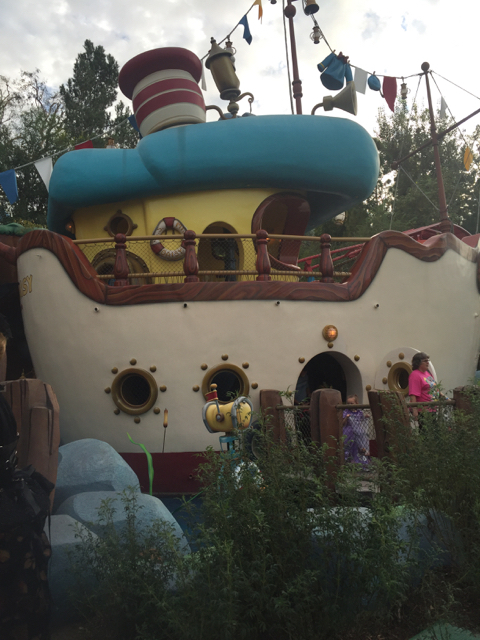 At 5pm we went into Mickey's Toontown for the pre-party, which featured three treat trails and some photo ops. Mik enjoyed that two treat trails went through attractions we haven't done in years (Minnie's House, Mickey's House, and Donald's Boat). The first trail we did was Minnie and Mickey's houses. 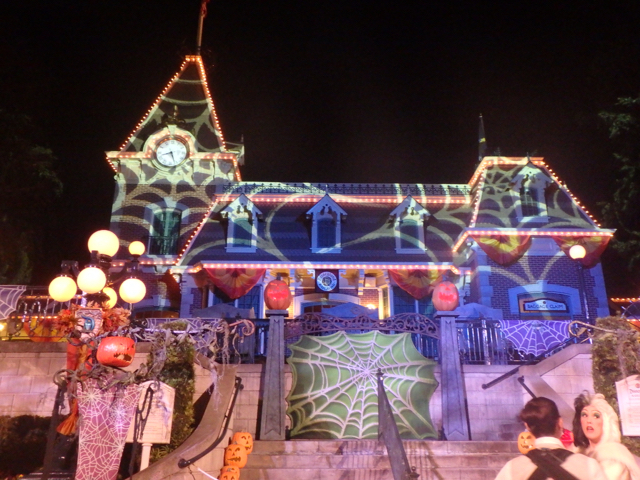 The entrance for this one queues over the trolley tracks some, but we got in it before it got long enough for that to be an issue. Mik especially enjoyed being able to go through Mickey and Minnie's houses without having to do the character thing, which is why we never do them. 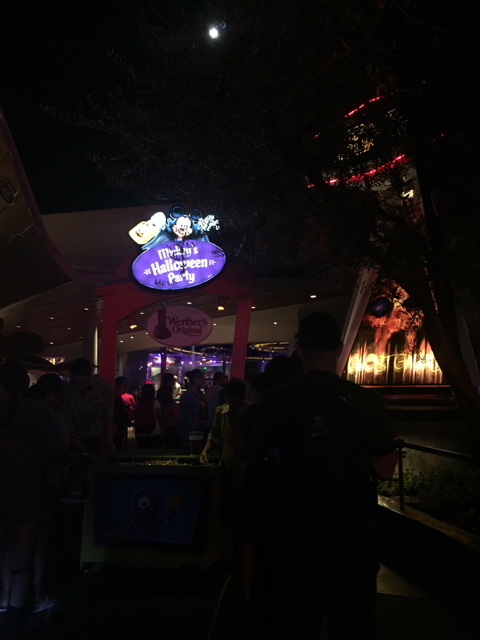 The Donald's Boat trail was the only one with a truly accessible queue as it didn't go over the trolley tracks. It does end where there's no cutout on the curb, but as long as there isn't people parking strollers where they're not supposed to like we experienced it's easy to follow the sidewalk to the cut out. 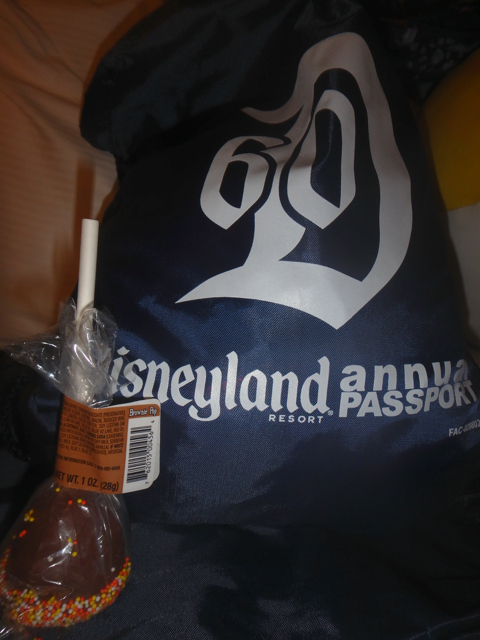 I'd say that I wish we skipped the trail over by Roger Rabbit's, but then it was the only one in Toontown with my favorite Werther's candy. The accessibility of the queue is absolutely horrible though because it has switchbacks around the trolley tracks where the tracks are crossing each other making it very difficult to avoid getting stuck in the tracks, which we did for a second at one point. 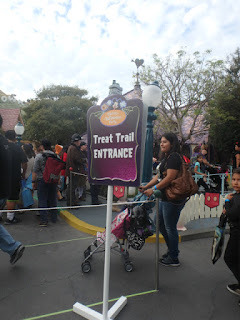 I really don't get why they have it set up that way because not only are there a lot of wheelchair and scooter users at these events, but the treat trails are lines that strollers can actually go through so more than half the groups have some sort of wheeled vehicle. 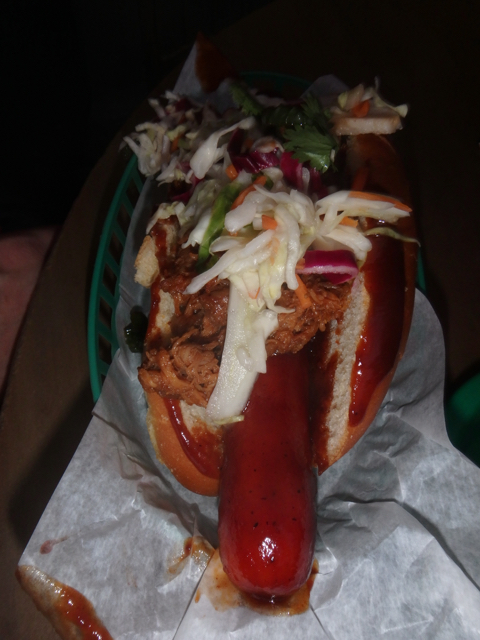 After hitting each trail in Toontown, we decided to head over to Critter Country because Mik had been wanting to try the pulled pork dog and it seemed a good place to start the party at 6pm. We got there right as they were opening the treat stations there and hit one before getting dinner, which was perfect timing as we got our food before the Hungry Bear started to get quite busy. Once fed, he was ready for hit the treat trails. 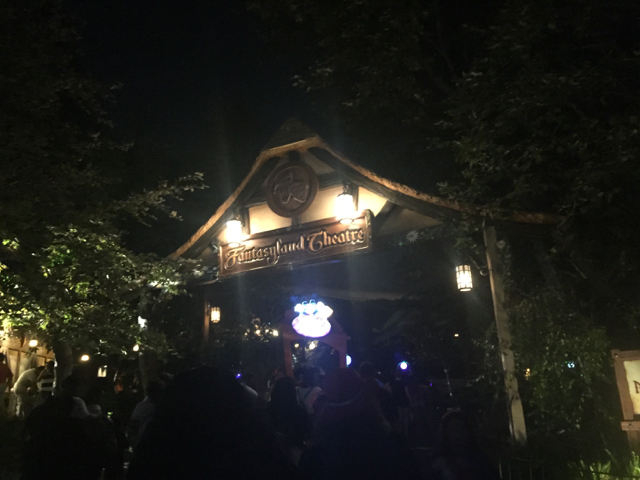 We started in Critter Country and worked our way back towards Main Street hitting the trail in New Orleans Square and the one along the Rivers of America. The one along the Rivers of America was particularly enjoyable because the water is "spookily" light up and has fog. Walking down Main Street after dark was fun as they had projections on the buildings and Halloween music playing. 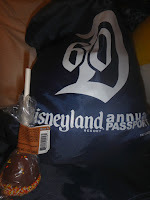 On Main Street we got our Annual Passholder treat, which was a drawstring bag with a Disneyland 60 logo and a brownie pop. 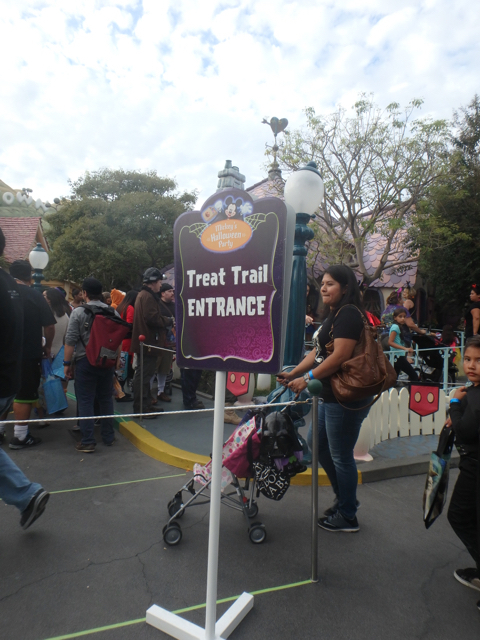 Next we did the treat trail that goes behind the buildings on Main Street towards Tomorrowland. 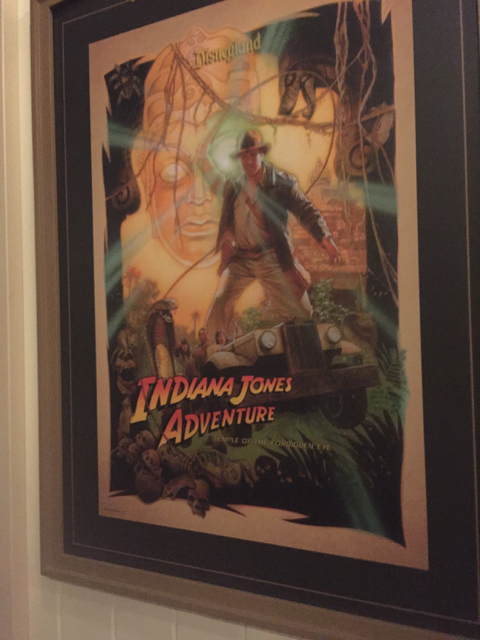 This was our favorite trail because the walls have a lot of attraction posters on them. 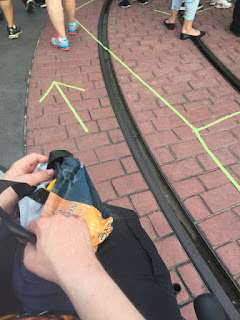 In Tomorrowland, we were going to start with the Space Mountain trail, but the line was all the way back up the ramp to the ride entrance. 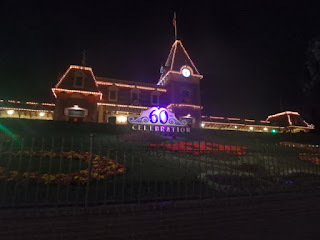 Thus, we decided to do the one near Autopia and check back later. The Autopia one is rather long with you hitting one station and then taking the long ramp up to the Monorail platform before hitting the other stations, but it was also one of the best in that the line moved steadily because of that long gap between the stations. Next we headed to Fantasyland. 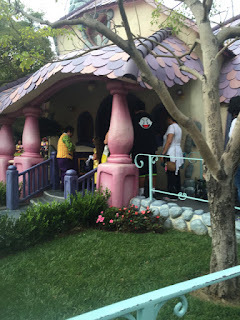 The line for the one by the Matterhorn was very long and barely moving, so we skipped it and went to the one that goes through Pixie Hollow, which was another area that was fun to go through without the character aspect. 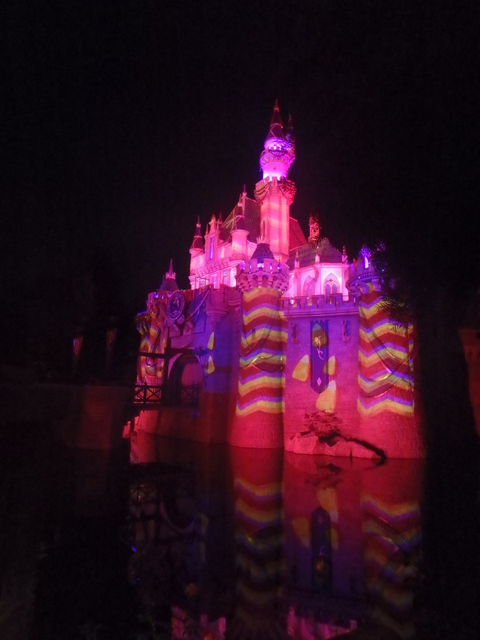 We then took a break to enjoy the seasonal projections on Sleeping Beauty's Castle and visit the Dwarfs Fountain. Next we did the trail at the Fantasyland Theatre. 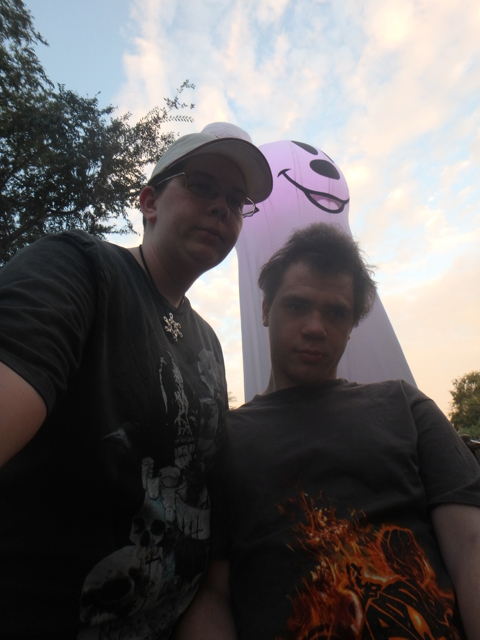 At this point, Mik was getting tired and worried about getting out of the park before the parade. Thus, we decided to head out via Tomorrowland checking to see if the lines had gotten shorter at the ones we had skipped earlier. The Matterhorn one was even longer than before, so we again skipped it. The Space Mountain one we would've done even if it was long because we knew it had the Werther's, but it was actually much shorter than it had been earlier. 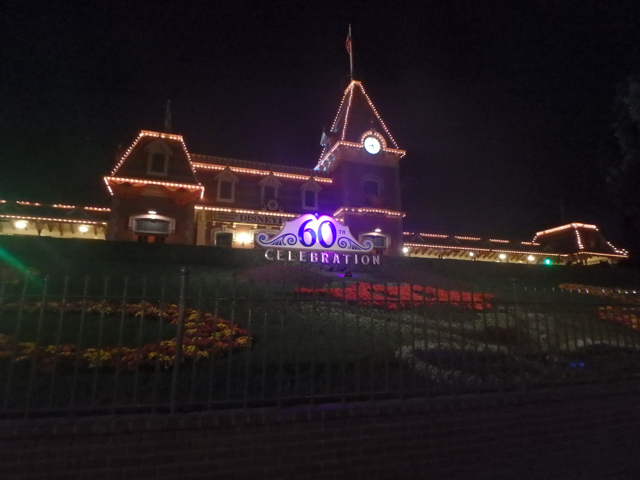 On the way out of the park we stopped to take some pictures of the decorations on Main Street and hit one last trail in the square on Main Street. Overall we really enjoyed Mickey's Halloween Party. Mik particularly enjoyed the experiences of the different treat trails, especially when they went through areas we don't typically go. While it was crowded, the trails definitely got shorter other than the Matterhorn one as it got closer to parade time. Also, even when the lines went past the Trail Entrance signs it always was easy to find the end, which is the main problem that made us hate the Magic Kingdom party last year. Mik said it just seemed better laid out and organized. 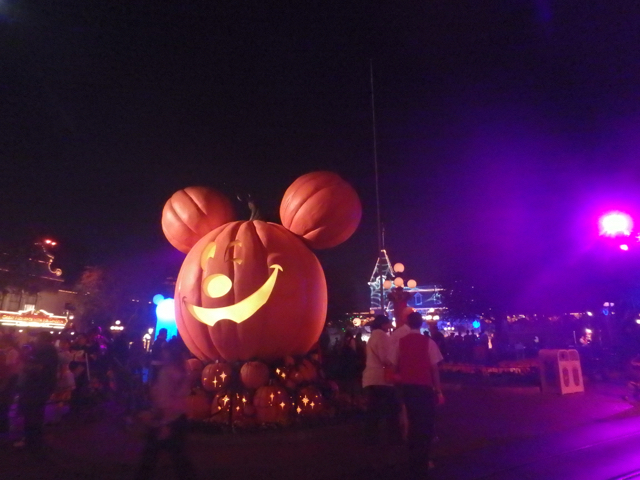 Plus, the giant Mickey Pumpkin on Main Street is just totally a necessity. 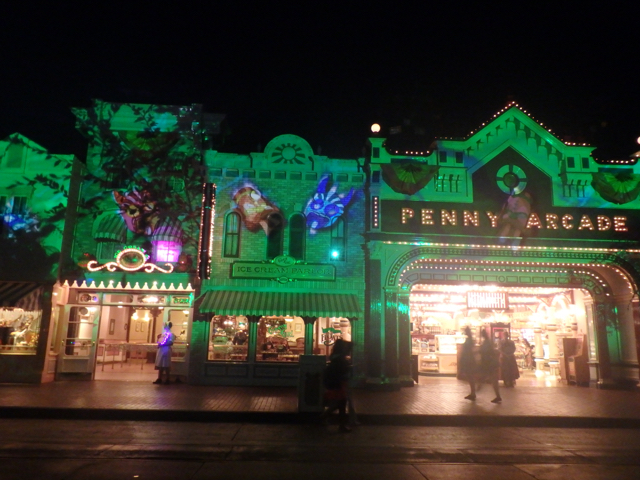 Also, since I had visited Disneyland Paris last week the daytime decoration game seemed much weaker here and I really did need to see the nighttime lights on Main Street to be impressed with Halloween at Disneyland again. 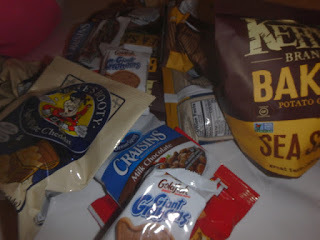 We also really liked that it seemed much easier to collect the snack/healthy options this time including some stations being just apples and carrots. 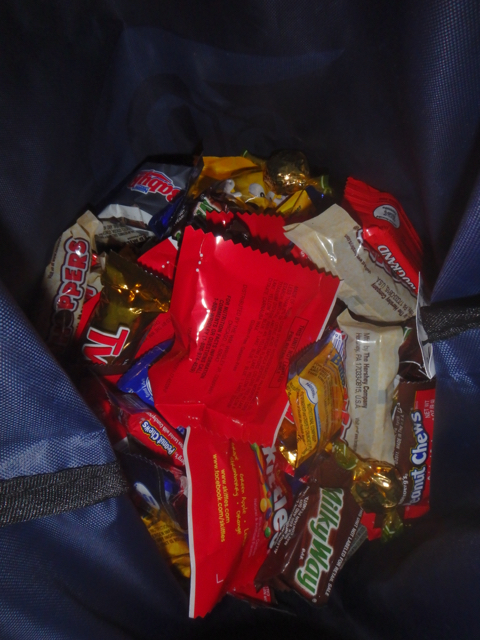 Of course, we still also got a lot of candy, but Mik is happy to have some snacks for the plane trip home tomorrow.